Genesee issues GMail accounts to all students, which means all students also have access to Google Docs. All instructors do not all have access to Google Docs and, when it comes to turning in assignments, most Genesee instructors are expecting Word documents (*.docx format). Current students can get Microsoft Office for Home Use, to be able to create *.docx documents for their instructors. Google Docs cannot be directly uploaded to Blackboard. Students who regularly use Google Docs should not assume instructors will accept electronic submissions in that form and should check with the instructor on what is an acceptable format. Documents created in Google Docs can be downloaded as *.docx files. 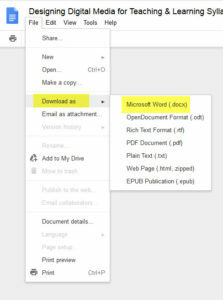 In the File menu is an option to Download As… the first option is Microsoft Word (*.docx). The file is saved to the ‘downloads’ folder on the computer. This new document can be then uploaded to Blackboard or sent as an attachment in an email.